The next 28 of November inaugurates the Teatro Real new space dedicated to flamenco in its Ballroom, with regular performances at alternate Wednesdays 20.30 hours until the 17 July 2019, with artistic direction of Aurelio Solana. 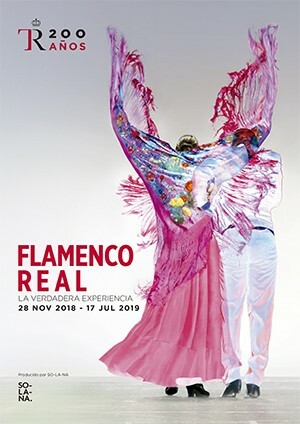 In this first season, REAL FLAMENCO will consist 18 singing and dancing shows featuring renowned artists, They are representing different families, schools and schools of art deeply rooted tradition, but permeable to personality and personal styles of their various interpreters. Como ejemplo de esta diversidad podríamos citar a José Carmona “Rapico”, Carmen "The Talegona", Yolanda Osuna or Antonio Canales. the old Ballroom Theater Royal, completed in 1835, It was originally intended to parties and masked balls that night dragged on in. Later, between 1841 Y 1850, this room had a huge significance function, giving shelter to the regular meetings of the Parliament of Spain, while the Congress of Deputies was built. Their 500 square meter, fronting the Plaza de Isabel II, are versatile and multipurpose space today, heir to the hall of the conservatory, also stayed in the building for nearly four decades Real. The dance club It will become from now on warm flamenco show, enriching the mythical space with the Spanish artistic heritage, within the framework of the policy of opening to the Royal Theater styles and different languages, promoting dialogue between different forms of expression. At 20.30 hours one tasting product 'mark Spain' will serve as a prelude to the action that will take place at 21.00 hours. At the end of the same, viewers who wish may enjoy the company of artists and get close so, personalized way, the world of flamenco.